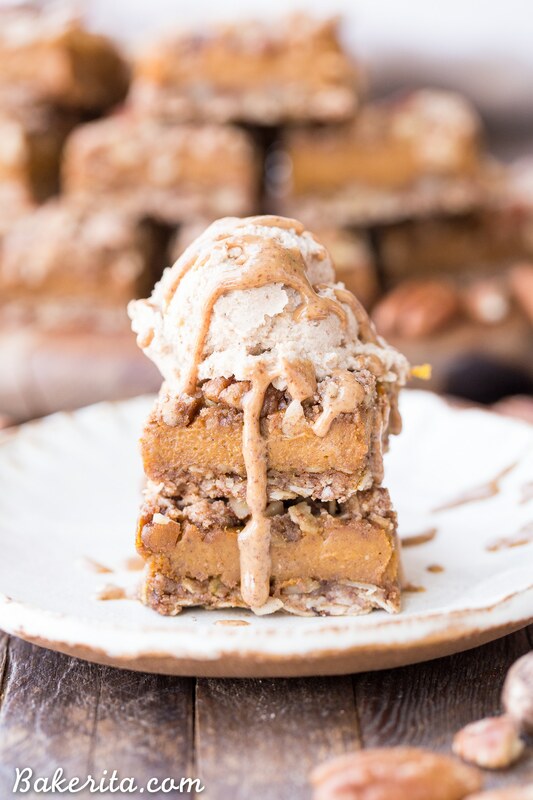 These Pumpkin Pie Crumb Bars have an oatmeal crust and crumble with a smooth and sweet pumpkin pie filling! 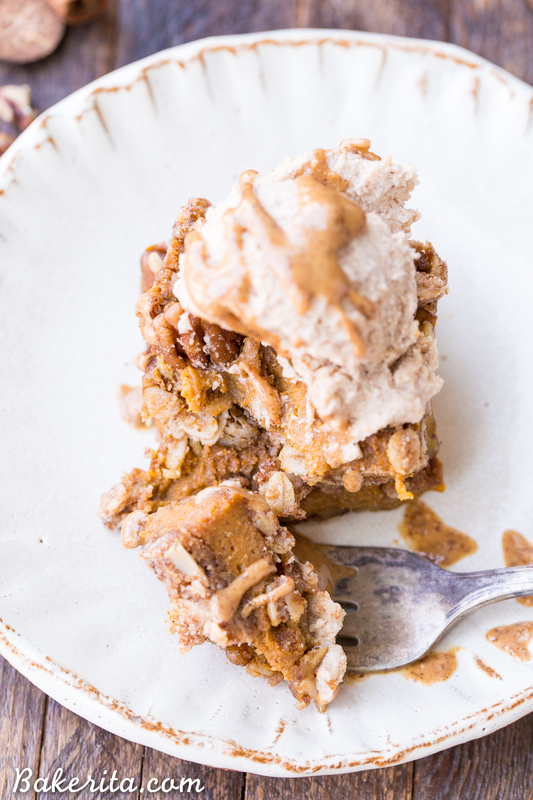 You’ll go nuts for this gluten-free, refined sugar-free and vegan portable pumpkin pie. It’s crazy that I’ve been blogging for over seven years now – that’s a really long time to keep coming up with new ideas without getting bored and burned out. One of my main motivators, besides all of you lovely readers, is the friends I’ve made along the way. Any blogger will tell you – having a group of blogging friends, even if they’re ones you’ve never met in person, is what can keep you sane and motivated when it gets hard or frustrating. You see, blogging isn’t just making and photographing recipes. There’s all the back-end junk that’s hard and confusing, but so necessary. I’ve been in a Facebook group with some amazing blogger ladies for a few years now, and so much of the time, they’re my blogging support system. When I didn’t know how to set-up my site as HTTPS:// or my email subscriptions weren’t going through, they’re the first people I turn to for advice or to test things for me. But besides the blogging stuff, we’ve become friends who share in each other’s triumphs (blogging or otherwise) and despairs, and are always there to support one another. I had the pleasure of meeting a bunch of the ladies in the group last year, and they are all just as fantastic in real life as they are online (no surprise there). So, when three of them got pregnant within about 2 months of each other, a baby shower had to be planned to celebrate their new little ones! Ashley of The Recipe Rebel, Denise from Sweet Peas & Saffron (the meal prep queen! 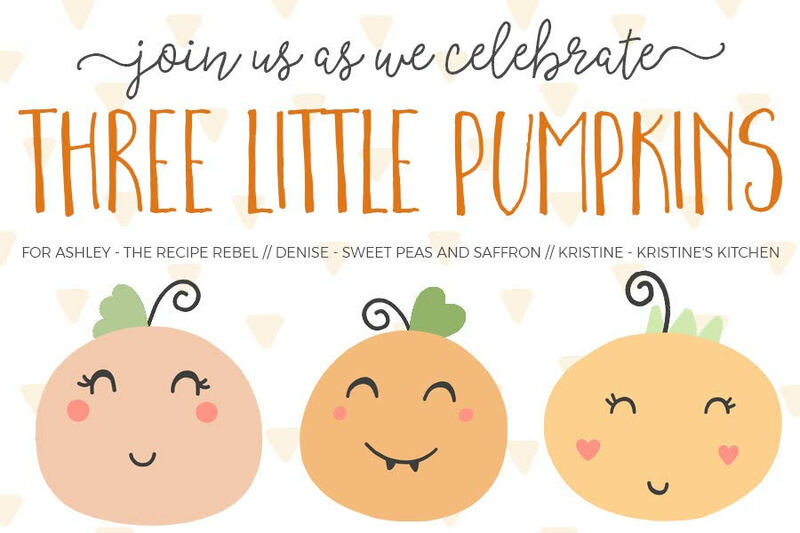 ), and Kristine of Kristine’s Kitchen are all expecting new little pumpkins this Fall, so we got together to throw them a Fall-themed bash, full of delicious pumpkin and spiced treats. Ladies, I’m SO excited for you all and can’t wait to see photos of the newest additions to your family. You all are amazing mothers, and your little ones must be so excited to have a new sibling on the way. I wish we were having this in person so I could give each of you a big, congratulatory hug!!! I also wish we were doing this in person so we could eat all the fantastic goodies being made for this baby shower…I’ve got them all listed down below, right beneath the recipe, so you can see all the other delicious treats being made. 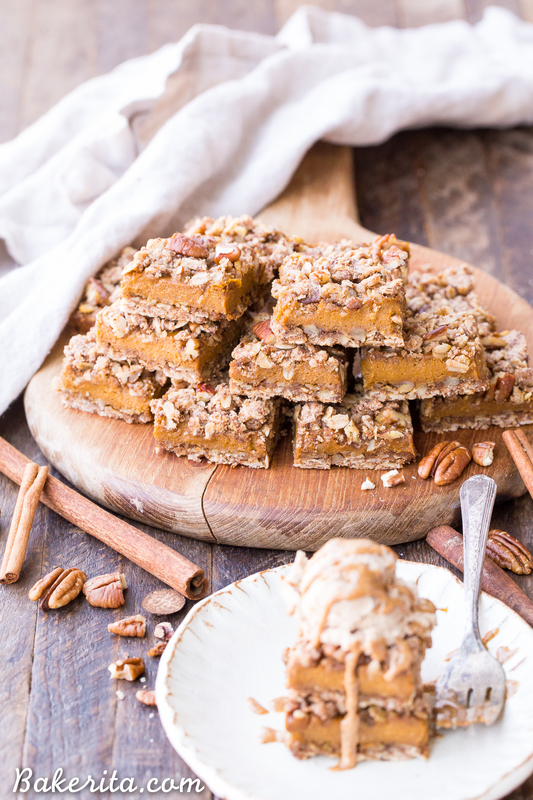 But now, let’s talk about my contribution: these Pumpkin Pie Crumb Bars! The oatmeal crust and crumble provides a crunchy bite to the bars, and it isn’t too sweet like some crusts can tend to be. It’s got rolled oats for texture and pecans for a bit of extra crunch. The filling is the real star of the show, though! It’s a vegan pumpkin pie filling, and it’s perfectly spiced and so deliciously smooth and creamy. It’s everything I want in a pumpkin pie filling, tucked between layers of crumble that make this way more portable and delicious than your average pumpkin pie. In fact, I don’t think anyone would mind seeing these in place of a classic pie at your Thanksgiving feast. And being gluten-free, refined sugar free, and vegan, it’s a healthier option too! 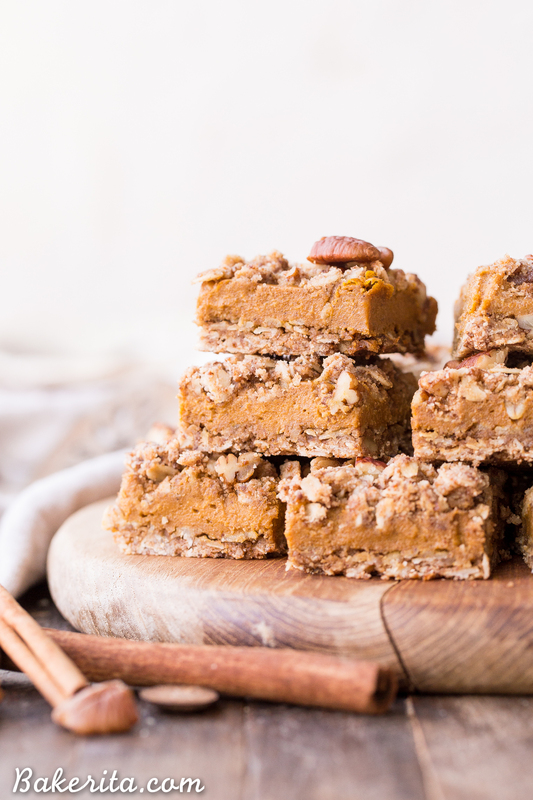 These Pumpkin Pie Crumb Bars will have you cheering, whether you’re celebrating anything or not! Hope you love them!  Sending Ashley, Denise and Kristine so much love in their last months of pregnancy, and wishing I could give you these bars in real life. Make sure to check out everyone else’s contributions below. 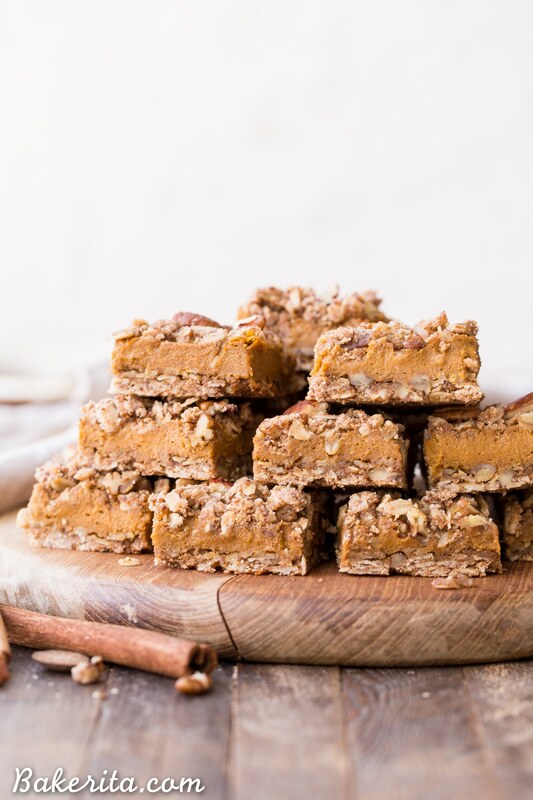 These Pumpkin Pie Crumb Bars have an oatmeal crust and crumble with a smooth and sweet pumpkin pie filling! You'll go nuts for this gluten-free, refined sugar-free and vegan portable pumpkin pie. While it bakes, make the filling: in a blender, combine all of the ingredients for the filling and blend until fully combined. Remove partially baked crust from the oven. Pour on the pumpkin filling. Top with remaining crumb mixture. Return to oven and bake for another 30 minutes or until lightly browned on top and a toothpick comes out clean. Let cool completely before cutting into 16 squares. Store in an airtight container in the refrigerator. Thank you so very much for the love, Sarah! Wishing you a fast and comfortable recovery, Dorothy! Thank you so much for the kind words! WOW good job! Your changes sound amazing, so glad they were a hit. Thanks for your feedback, Dorothy. YAS! I love making (and eating!) pie bars. So much less work than actually pie or making individual cookies. These sound amazing. Love the layers! I almost made pumpkin pie bars for this shower too but had to take a break from dessert! haha Pie bars are so much easier and I love that these are healthier — there are so many wholesome ingredients in these! They’re so rustic a beautiful! Absolutely love this recipe Rachel! It’s not so easy to find pumpkin puree in a tin in the UK, so I make my own. I’m gonna need a lot of pumpkins this year! 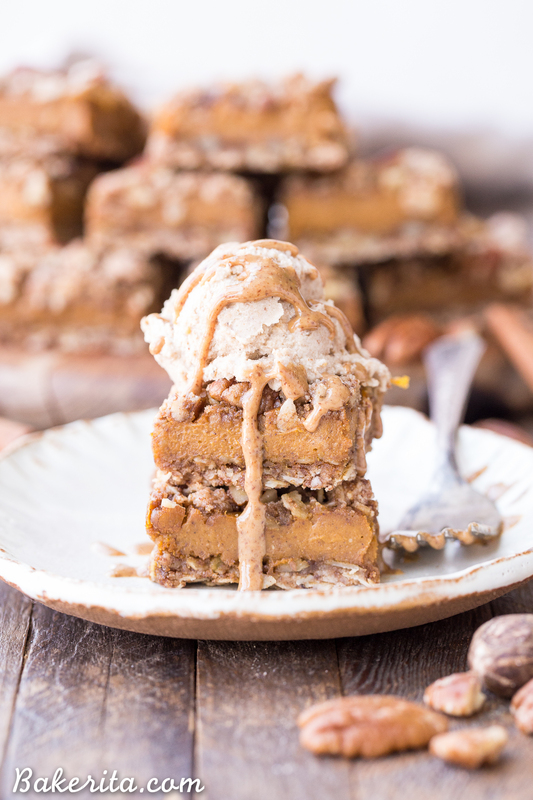 This is the best twist ever on pumpkin pie! You ladies are the best support system a girl could ever ask for — you definitely keep me as sane as possible in all the chaos! First of all: these bars look INCREDIBLE! I could seriously eat the whole plate (it’s for the baby, he he). Secondly, you ladies have totally made my day…you are the BEST! Thirdly, I don’t know what I would do without you all…would I even be blogging still? I’m so grateful for your friendships and for our group. Thank you, Rachel! These bars look awesome, Rachel! Love your new site design as well!! Omg! Can’t wait to try these! Now, for the coconut cream part, do you just scoop off all the cream from the top of the can? Hi Amanda, yup, you just measure out the thick creamy part from the top of the can. Enjoy! I hope you’ll give them a try, Stacey! Thanks for the love! I love these bars – all those crumbs are everything! So glad you’re loving them, Michelle! Thanks so much for your feedback. Hey Rachel! I just made these – so delicious! But the bottom didn’t hold together for me – it just crumbled. Any tips for binding it together better next time? Hi Sarah, sorry that it didn’t hold well! It important to make sure it’s pressed into the bottom really well and firmly, and it should be beginning to set after the first bake. Next time, you could try baking the bottom a little longer and/or pressing the bottom crust down again firmly once it comes out of the oven. Hope this helps, and enjoy! I’m allergic to coconut ( I know, how do I vegan w/o coconut oil??) It’s sad but it’s my reality….what you recommend as a substitute?? Plz help!! & Happy almost Thanksgiving! Hi Haley! Hmm…that’s a tough one. You could use palm shortening or a neutral flavored cooking oil, like avocado oil or vegetable oil. Enjoy!! Sorry if I missed it, but what is the sauce you’ve used over the icecream & bars?? I actually didn’t include it here, because it was just leftover in my fridge, haha! But it’s a “caramel” sauce made from 1/2 cup cashew butter, 1/3 cup coconut oil, and 1/3 cup maple syrup, all melted and whisked together. That’s all! You’re awesome! Thanks!!! Happy Thanksgiving! Yum! I want to make these butmy husband has an almond allergy (in addition to gluten and dairy!!). Any recommendations to replace the almond flour and butter? For the almond butter, you can definitely sub a different nut butter like cashew butter. For the almond flour, you can use another nut flour, like cashew flour, or try using oat flour or a GF flour blend. Hope this helps! Can I use arrowroot starch instead of tapioca? Yup, that should be fine! Enjoy! Hi! Can the coconut sugar be replaced with maple syrup? And any substitution for the coconut cream? Thanks. Hi Hazel, unfortunately, that will change the texture and make it too wet – you’d need to add more flour but since the recipe was not developed that way, I don’t know how much you’d need to add. You could try adding another dairy-free milk in place of the coconut cream, but those are all much thinner than coconut cream so you’d add to want a little bit less. I actually made these last night and am delighted with them! They were super easy to make and quite tasty. I plan to make them for Thanksgiving because I see them as fool proof and something usually goes wrong when I bake so I can at least be confident that I will have one delicious dessert for my guests. I did make some substitutions… I didn’t have tapioca flour so I used almond flour in the filling instead, and I also didn’t have pecans so I used chopped almonds. I’m a nutritionist and try and make things a tad bit healthier so I cut the sugar back from 1/3 cup to 1/4 cup, and the coconut oil from 1/3 cup to 1/4 cup. I got nervous at one point because the brand of coconut cream I used (whole foods) was all liquidy even though it was full fat, and I was sure it was going to ruin it but it still held together nicely . Thank you! So thrilled you enjoyed them Kat, and that they worked out well with the substitutions! They are pretty foolproof :) hope they’re a hit on Thanksgiving. Amazing! I even forgot the almond butter in the filling and they still came out great! These are a hit at my house! Thanks!